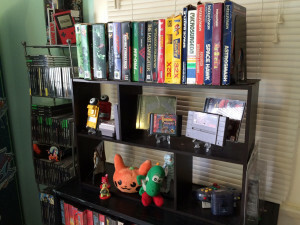 Below is the Fangirl interview with Scott about her collection, old Nintendo and the special mementos that come with collecting retro games. 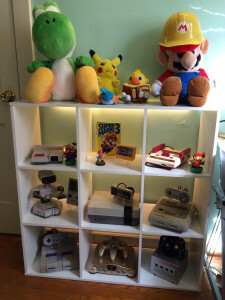 Can you tell me how you got into gaming and started your collection? 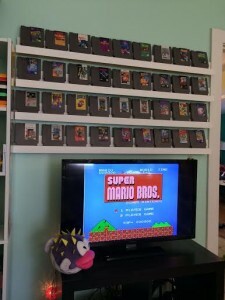 I think the Nintendo was in the house before I was even born so it’s always been there. I just started playing as a little little kid and it’s something that’s been with me my entire life. And I never really wanted to get rid of any games so it just became a collection on its own. 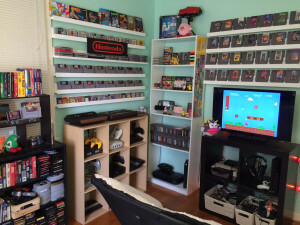 So there was never really a point where it was like ‘hey I’m going to collect video games,’ it was something that I always had. Which Nintendo did you start with? I had the original NES, the front loader one. Do you still have that in your collection? Oh yeah. I still use it. That’s the one that I play on. It still works. Cool. Can you tell me what else you have in your collection? 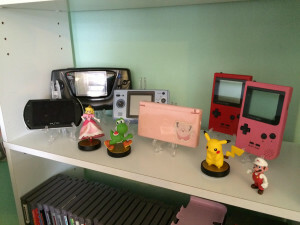 Any other game systems or do you mostly focus on Nintendo? Definitely old Nintendo is my favorite thing to collect. I also have Sega Genesis, Sega CD, a ton of Playstation and Playstation 2. 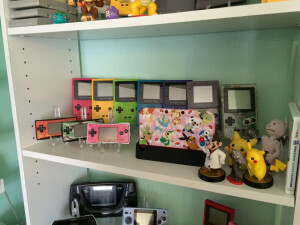 I also do have modern stuff too, but mostly old Nintendo. Pretty recently I decided that instead of collecting whatever I could find, I was kind of going to focus on something. So, old Nintendo is my favorite so I’ll just focus on Nintendo and Super Nintendo and stuff like that. Photo courtesy of Brittney Scott. 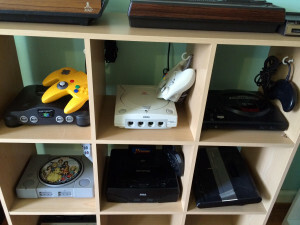 So comparatively, between modern and retro, do you have more retro stuff in your house? Oh yeah. 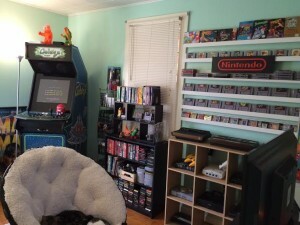 My husband is more of a modern gamer, so we have everything, but I basically only play, this is kind of embarrassing, but I only play Call of Duty. A lot of people are surprised to hear that because they don’t think I would be the kind of person to play that. But the past five years I’ve just had one modern game for the current system and that was Call of Duty and then I collected old stuff. 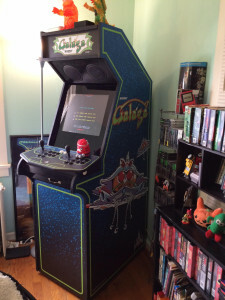 I saw in the Tumblr pictures you have a cabinet arcade game. How did you get your hands on that? I made it, actually. It was a couple years ago, I found some plans online that somebody had made and they gave you step-by-step instructions. So I built it with my dad and it was a really cool father-daughter project and I got to design the graphics and everything. It’s definitely the coolest thing I’ve ever made. It’s actually a MAME cabinet, so you can put whatever you like on it. 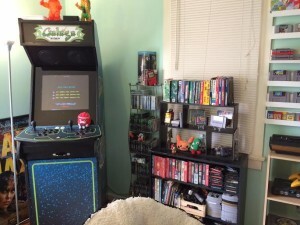 I usually just put the old, old stuff like Galaga and stuff like that on it. It’s basically just a really fancy computer cabinet. There’s a regular desktop computer inside of it with fancy firmware. I also noticed in your Tumblr pictures that you have a lot of Gameboy Colors and all that stuff. Any reason why you have so many? I used to work at GameStop when I was in college and around seven to 10 years ago retro games weren’t really popular. It was really easy to get cheap stuff like that. So I was working there and they clearanced them down to less than $10 and I saw all the colors there, and I started picking them up for really cheap and that’s where I started picking up collecting and getting more serious into it. It was so easy to find stuff and it was fun to be like ‘oh, I really wanted this as a kid,’ and now I have all of it because it was so cheap. 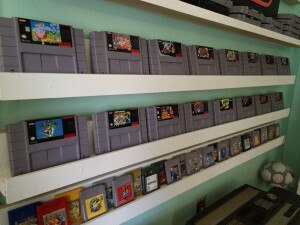 Nowadays, retro gaming is really popular again so when people see that sort of thing they’re like ‘that must have been so much money,’ but I’ve had them for so long, it’s funny because now places like Gamestop will take retro games in trade and they’re selling them again. But 10 years ago they were the same games they were clearancing out to people for $10. That’s where a lot of my collection came from. That’s a cheap way of going about it. Less money for all this cool stuff. People ask me on Tumblr ‘oh my god, how rich are you? You must have so much money,’ but this collection is as old as I am, basically. I never really buy anything for full price, it’s something I just happen upon and get it for free or cheap. Yeah, I’m not rich just lucky. So what’s the latest piece you added to your collection? Actually, I just got married in August and we went to Japan for our honeymoon because we’re both big dorks and we wanted to see the Pokemon Center and see the Super Potato, this really big gaming store. I picked up an original Famicom, which is the Japanese version of the original NES. I was so happy to get that, it’s amazing. It’s such a fun little thing. I also saw that you have a Virtual Boy, the original 3D Nintendo game. How is that thing? People say that it gives you headaches and stuff but I think it’s fun and silly. When I finally got to try it after hearing so much bad stuff about it I was like, this is really cool for the time, but you feel so dumb sitting there putting your face in this thing on a little stand on the table. You don’t look cool when you play it. What’s your favorite game or piece of your collection? That’s a hard thing. If my house were on fire and I had to save one thing it would definitely be the original Nintendo because that’s like an old friend. I do have a piece that’s important to me. My grandma actually gave me when I was a kid. I live in New York so she would not actually play with us, she would be playing by herself in Florida so she would finish a game and then she would mail it to me. I didn’t really appreciate that was when I was little like nobody’s grandma really plays video games but I got all these amazing games from her like Castlevania: Symphony of the Night. She had really good taste in Dungeons & Dragons games. They’re just really cool things to have because they have hand written notes from her inside. I love stuff like that, when you get something that has history from another person. I think that’s one of the coolest things about collecting. Do you ever find other people’s mementos? I have a couple games that have the kids’ name written on it or that have notes in the instruction manuals which I think is really cute. There was this one time this kid came in while I was working and he said that his next door neighbor, her son, had passed away and I guess she took all of her son’s video game stuff, put it in a box and went next door and was like ‘hey you have kids maybe they will appreciate this,’ but the kids didn’t care at all, so they wanted to pawn it off at GameStop for money. They told me this story and I felt so bad. I can’t imagine somebody taking my stuff after I died and wanting to sell it. I ended up buying it for $20 and there were all these well-taken-care-of RPGs and it was a bunch of Super Nintendo games. I could just tell that this kid really loved this stuff. He passed away and I have no idea who he was but maybe he would feel OK knowing that his precious things are taken care of. That’s why I want to take care of my stuff. Obviously there’s a lot of stuff that people don’t care about anymore but there are a lot of things that were special to people. A lot of people think it’s kind of weird, but the stuff that I said about the reasons why and if I can get that across maybe it can make more sense to people. Also, I’m an adult and I can do what I want and if I want to be surrounded by the things that I like then that’s fine. A lot of people come in and are like ‘woah, what is this?’ but I didn’t want to grow up and then put all my stuff away that’s important to me. It makes me happy. If you thought Scott was cool (and she is, our conversation was rad as hell) you can catch her weekly on the Pretend Wizards podcast, a live-play podcast where Scott and her friends play Dungeons & Dragons, on iTunes. 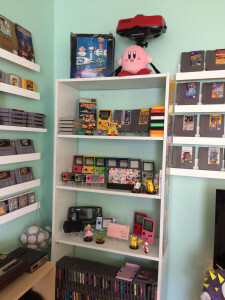 Also, if you want to see more fan caves on Fangirl check out our story on Melissa Batchelor’s Harry Potter fancave or read about comic editor Jennifer Smart’s battle station.